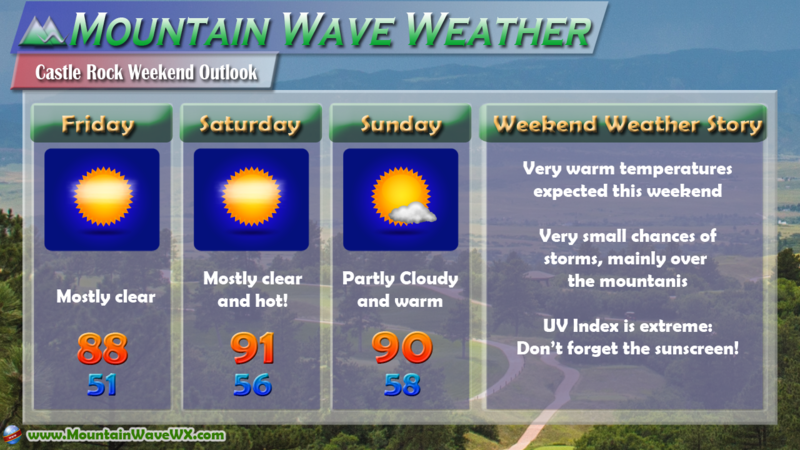 Summer will be in full swing this weekend with mostly clear skies and very warm temperatures along the front range. 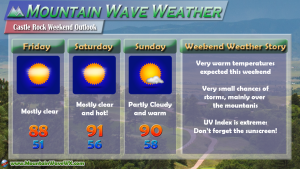 While Denver is expected to reach 90’s all three days including a brush with the upper 90’s on Saturday, Castle Rock won’t make it quite that high given our elevation. We will be warm however, expect temperatures on Friday to flirt with 90 degrees and expect us to just make it into the 90’s on Saturday and Sunday. Storm chances are pretty low at around 10% each afternoon, but any storms that form over the mountains will have trouble staying alive long as they move out onto the stable environment we will have on the plains. With that, we’re not really calling for a good chance of rain it will mainly just be hot and dry! Our warm air this weekend is the result of a very “summer-like” pattern that we often see more of in July and August, but June is also no stranger to this pattern. 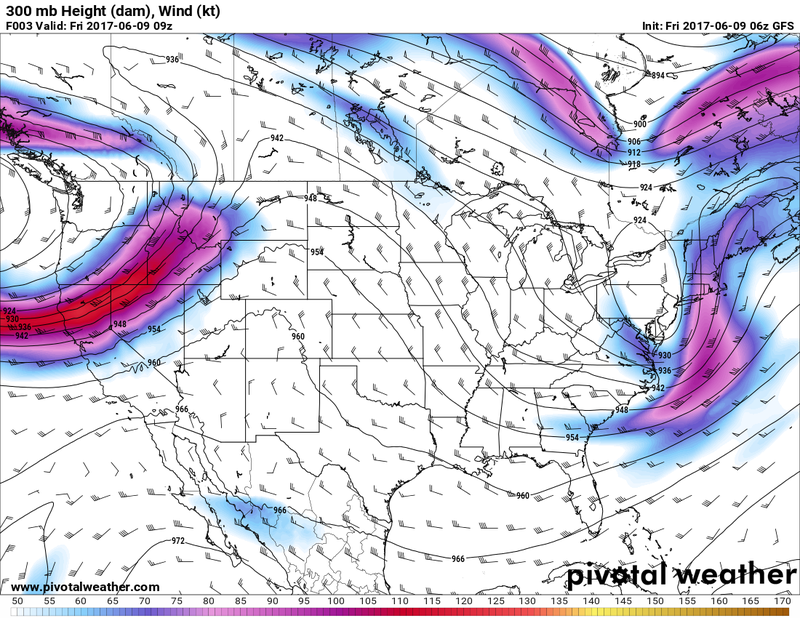 Upper air model shows a pronounced ridge over a good portion of the U.S.
With the jet stream off to the North and a ridge building over Colorado and the Southwestern U.S. this keeps the storm track largely away from us. This usually means it gets very dry for us minus a few pop up storms due to daytime heating. A strong upper level ridge also means another thing: heat! 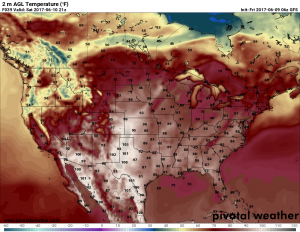 The other effect it has on our weather is that it allows very warm air to infiltrate the country from the South and Southwest. 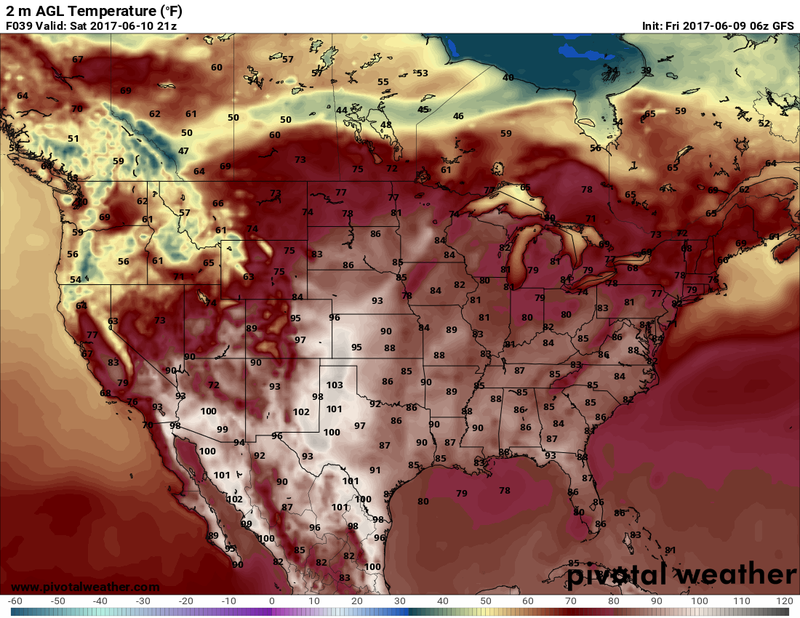 A GFS snapshot of daytime highs for Saturday shows that some areas South and East of Colorado are in for a scorcher this weekend! You could call this a bit of a heatwave for Colorado as our normal daytime high for this time of year is in the low 80’s for Denver. Temperatures in the mid and even upper 90’s would be considered pretty well above average. The good news is that we see hints of a change by around Tuesday next week that will bring cooler temperatures and some chances for rain, so overall this “heatwave” looks pretty short lived for now.